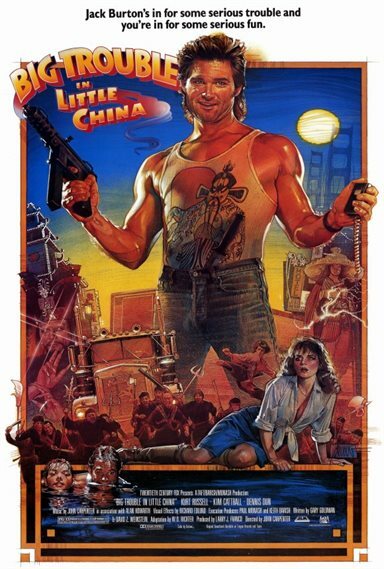 Jack Burton (Kurt Russell) is a simple man who doesn’t believe in ghosts or magic until he’s swept into a mind-boggling adventure deep within Chinatown’s mysterious underworld. Burton’s pal, Wang Chi (Dennis Dun), is trying to rescue his kidnapped fiancée. Egg Shen (Victor Wong), an enigmatic tour-bus driver seems to know a lot about ancient Chinese magic for a simple tour-bus driver. They do battle with an outlandish array of human and inhuman adversaries under the command of Lo Pan (James Hong), a 2000-year-old evil magician who has the power to transform himself from a wheelchair-bound old man into a seven-foot-tall mystical menace. Download Big Trouble in Little China in Digital HD from the iTunes store. Big Trouble in Little China images are © 20th Century Fox. All Rights Reserved.